Use GetResponse to gain new subscribers during a pre-chat survey and broaden the reach of your Email Campaigns! All of that with the use of simple LiveChat-GetResponse integration. Go to the GetResponse integration page and click on Install app button. You will be taken to the Settings > Apps > Integrations section of LiveChat, with GetResponse app settings. Keep this browser tab open when following next steps – it’ll be easier for you to provide required data. Log in to your GetResponse account and get the name of the existing campaign that you would like to integrate with LiveChat or create a new campaign. To get the name of your campaign or create a new one, log into your GetResponse dashboard. Click on Your current campaign drop-down menu. There, you will find the list of your campaigns and you will be able to create a new one, by clicking on Create campaign. On the next screen, choose a name for your new campaign and click on Add Campaign button. Now, add the campaign’s name to GetResponse app settings in LiveChat. It is time to get your GetResponse API key. Hover your mouse over My account menu in the top right section of GetResponse and click on Integrations. 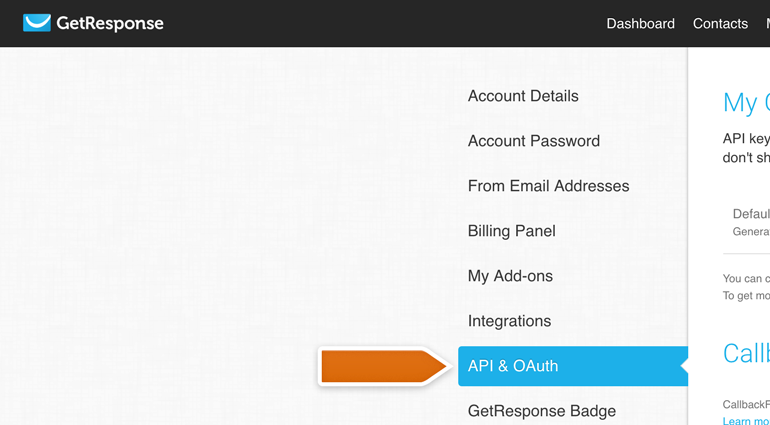 Next, click on the API & OAuth. Acquire your GetResponse API key by clicking on the copy button. Now, go back to GetResponse app in LiveChat and paste your GetResponse API key. Then click on Save changes. From now on, your GetResponse is integrated with LiveChat! To finalize the process, add E-mail with confirmation button to your pre-chat survey. Done! Now LiveChat is integrated with your GetResponse and you can start expanding your subscribers’ list! Hopefully, you have found this article helpful but if you have any additional questions, feel free to start a chat with us – we are available 24/7/365!